Since New York-based band Hollis Brown started out in 2009, they have grown into one of the most convincing current young rock’n’roll acts. While their music is based on an almost inexhaustible pool of 60s and 70s influences yet anchored in the here and now, their releases show a clear development from the raw, direct sound of their debut to the complex, multi-faceted approach on their new album 3 Shots. The album’s eleven songs document Hollis Brown’s grown creativity, more substantial songwriting and a more clearly-defined identity. 3 Shots is their fourth full-length album, the first to be released in Europe on Blue Rose Records. Named after an early Bob Dylan song (‚The Ballad Of Hollis Brown‘), school friends Mike Montali and Jon Bonilla founded this band as a quartet in 2009 in Queens, NY. Their eponymous debut and a few privately released EPs indicate great passion and drive as well as a search for musical direction. 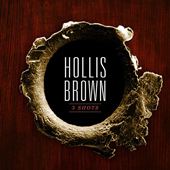 With the widely distributed 2013 album Ride On The Train Hollis Brown started a-rolling – with very fresh-sounding first-class American rock’n’roll. Combining 60s and 70s virtues with No Depression and alt.Americana sounds, the foursome convey a deep appreciation and knowledge of Creedence Clearwater Revival, Neil Young, The Band, Tom Petty, Rolling Stones and The Kinks. Produced by the experienced Adam Landry (Allison Moorer, Deer Tick) Hollis Brown are entering a garage-y, blues- and southern rock-drenched terrain with an indie-rock-meets-alt.country-vibe not unlike Marah, Middle Brother, Felice Brothers, Delta Spirit, even Whiskeytown or Green On Red. The minimalist-rocking rhythm section of bassist Dillon DeVito and drummer Michael Graves provides a steady rumbling beat, lead guitarist Jon Bonilla knows exactly where to be economical and where to be crunchy with his riffs and Mike Montali is a mesmerizing frontman, teasing the audience with his high, nervous, cutting voice. Hollis Brown Gets Loaded, a limited edition vinyl release for Record Store Day created a huge buzz in the spring of 2014 with write-ups from Rolling Stone, Spin, American Songwriter, Pulse and others and became an international phenomenon. Paying homage to Lou Reed, Hollis Brown re-recorded Velvet Underground’s 1970s cult album Loaded in their own way. Demand got so high that they decided to release it as their regular third album. Extensive tours brought them to Europe and Germany for the first time and strengthened their reputation as an inspired, never-tiring, always exciting R&R act.